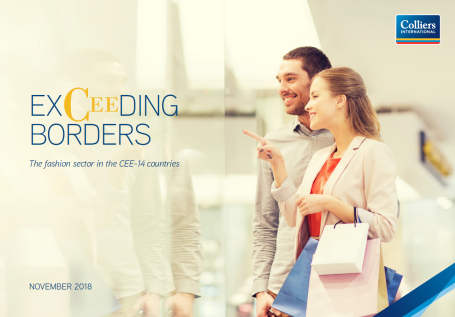 Fast recent-cycle GDP growth, low unemployment and wage hikes add up to booming conditions for fashion in CEE says Colliers International in its recent research report “ExCEEding Borders – the fashion sector in the CEE-14 countries”. Shopping centres dominate the retail industry in the region; the only market in CEE 14, where the high street segment plays a central role is the capital of the Czech Republic – Prague. The biggest shopping centres market in the region is Poland with nearly 500 schemes, totalling 11,8 mln sqm of GLA. Marjan Gigov, Director of Retail Agency at Colliers International Czech Republic adds: “Being in the Top 30 of the most visited cities in the world with over 7 mil visitors in 2017 together with the steady economy, growing disposable income and high brand awareness of the locals have created an excellent environment for many Luxury and Contemporary fashion brands to have their direct presence in the city, making Prague a true destination in the CEE region for High Fashion shopping. CEE is still attracting international retail chains – spectacular debuts are taking place in Poland (Primark), Romania (Victoria’s Secret) and Latvia (Van Graaf) among others. Polish brands are very active in the region, including Sizeer, present in 7 markets (Lithuania, Latvia, Estonia, Czechia, Slovakia, Hungary and Romania). In addition to its presence in shopping centres, the fashion sector is also a driver of volumes in ecommerce in the CEE 14 – in four countries (Bulgaria, Estonia, Poland and Czechia) its share in total e-commerce sales exceeds 30%. Fashion anchors in the CEE markets include H&M, LPP, Inditex, New Yorker, C&A and TK Maxx.